Argentina is bordered by Chile, Bolivia, Brazil, Paraguay, Uruguay and the Atlantic Ocean. Its capital and largest city is Buenos Aires. Transit time via air from Argentina to airport in the UK is approximately 1 to 3 days. Argentina's main cargo international airport is Ministro Pistarini, known as Ezeiza, located 22 kilometres of the Autonomous City of Buenos Aires. 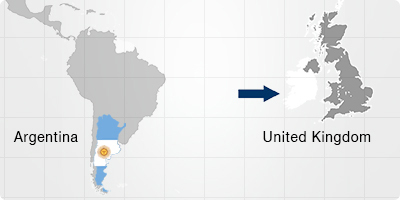 Transit time via sea from Argentina to port in the UK is approximately 28 days. Argentina’s main sea port is Buenos Aires. Import documents required include packing list, commercial invoice, and health / organic / phytosanitary certificate(s) where applicable. Requirements for the Argentinean exporter include registration with AFIP. Requirements for the British importer include having an EORI number. BuyArgentina is an online platform administrated by the Argentine goverment. The platform enables buyers to find Argentine products and exporters. Also visit Agencia Argentina de Inversiones y Comercio Internacional, the official department in charge of the commercial promotion of exports in Argentina. Visit the UK Trade Tariff to consult the applicable import taxes and restrictions (if any) to Argentine products. This is done by entering either the tariff code or the description of the particular commodity on the site's search tool.